A story of resistance across generations, the power of family and the unrelenting struggle for justice in a country that remains in denial. 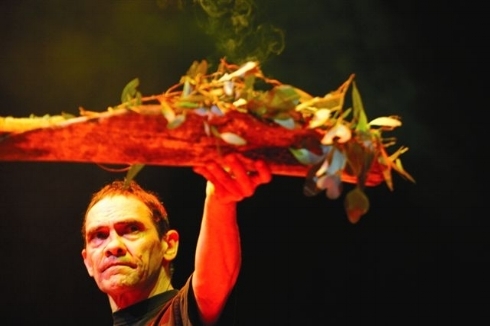 Controversial and uncompromising, Australian Aboriginal political activist Robbie Thorpe stands as part of a long line of Indigenous resistance to invasion. As the Victorian Government draws closer to signing the first Treaty with Indigenous Nations in Australia, the story of Robbie's relentless pursuit of justice is vital. Aboriginal political activist Robbie Thorpe stands as part of a long line of Indigenous resistance to invasion. This 55 minute documentary shows the making of this modern leader and tracks the resurgence of a powerful Black, Indigenous, anti-colonial movement that is currently reshaping the country. Our Warrior looks back at Robbie’s childhood, his family and explores the emergence of his radical politics in the formative years of Black Power in Australia, his apprenticeship in the 1970's under Dr Bruce McGuiness, and his emergence as one of the most controversial and uncompromising activists in Australia today. This film examines his political impact as an activist, how he sustains himself against such great odds and whom he has influenced. In doing so the film uncovers the story of how resistance and resilience is transmitted across generations and the power of family. Robbie is Krauatungalung (Gurnai) / Djapwurrung (Gundditjmara) raised in Yallourn, a State Electricity Commission town in Eastern Victoria and later moving to inner-city Fitzroy with his family. Robbie has organised challenges to ongoing genocide, colonization and assimilation for more than 35 years, always working toward indigenous economic and political independence. This documentary is the first to give us a sense of who he is the forces that shaped him. Robbie's high court legal actions on Genocide were broader than the Mabo case and shifted the national conversation and ultimately our laws. His series of high profile, controversial political and cultural interventions have shaken many, indigenous and non-indigenous alike, out of complacency. He remains a fierce and unrelenting advocate today. Our Warrior looks back at the 60-day Camp Sovereignty during the Melbourne Commonwealth Games in 2006, which Robbie rebranded as the StolenWealth Games and declared the Black GST (Genocide to end, Sovereignty acknowledged, Treaty to be made). It put Robbie in the international spotlight and attracted criticism from prime ministers, premiers and even other Aboriginal activists, including Elders. Camp Sovereignty’s influence, however, upon today's new generation of activists is profound. He is outspoken and always provocative, providing high-profile voice and leadership yet also acting as a mentor and quiet support to indigenous and non-indigenous people alike. He stands unapologetically on the most controversial and radical edge of Indigenous politics. Robbie draws the threads of two centuries of oppression together by relentlessly focusing our attention on the core injustices. His messages are critical to modern Australia. As the country debates its 'Australia Day' foundation myths and and governments grapple with Treaty negotiations with the First Nations of Australia, the story of Robbie's relentless pursuit of justice is vital. "Treaty would not be on the table today if it wasn't for my uncle Rob."